Sony is once again dealing with an apparent security breach -- this time a phishing attack on its Thai website. Earlier this morning, security company F-Secure posted a screen shot of a phishing site targeting an Italian bank that appeared to be housed under the hdworld.sony.co.th domain. 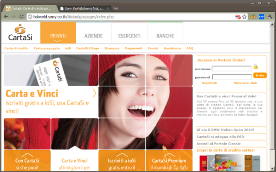 F-Secure posted a screen shot of a phishing site targeting an Italian bank, housed on a Sony server. F-Secure notes that this latest continuance of Sony's security and public relations woes is certainly bad news for the company but has nothing to do with the initial, massive PSN breach. "Basically this means that Sony has been hacked, again. Although in this case the server is probably not very important. Sony has been notified." F-Secure's Mikko H. Hyppönen later told thenextweb.com that it was possible the hacked sub-domain might actually be hosted by a third-party. "I believe this particular site might run on some ad agency's IP address. Nevertheless, it's under Sony's name, so technically, it's Sony's server." When I checked just moments ago, the URL indicated in the screen shot returned a 404 error, so it seems Sony, or someone, moved rather quickly to take down the site. Sony has already been warning users to be on the lookout for possible spearfishing attacks from hackers attempting to use information gained in the original PSN attack to try and pry more valuable information from users such as credit card numbers. But it seems the magnifying glass on the company following the PSN hack is turning up an ongoing series of smaller vulnerabilities in Sony's security armor.